The Comedy Playhouse and School (website, Facebook) in Tucson, Arizona is the latest company to produce You’ve Ruined a Perfectly Good Mystery! Performance times and ticket information are at https://www.thecomedyplayhouse.com/current-production. San Antonio’s Rose Theatre Company (website, Facebook) is the next company to produce You’ve Ruined a Perfectly Good Mystery! In a story in the San Antonio Express-News (‘You’ve Ruined a Perfectly Good Mystery’ gets SA debut), Rose co-owner Chris Manley, who is also in the cast, said “Whenever I produce a show, I’m in the mindset of, ‘I want to do a show I want to see.’ This is something I want to see.” The production is directed by Matthew Byron Cassi and will apply the fight choreography experience of cast members Joseph Travis Urick (The Detective) and Morgan Clyde (The Narrator) to showcase more combat than the previous productions. Below is the poster for the Rose production and a photo taken by Erin Polewski that accompanies the Express-News story. The Facebook event is here. This is the first production of Ruined to take place after the “Free Sherlock” legal decision that ruled Sherlock Holmes and Dr. Watson are characters in the public domain. That decision means we don’t have to be concerned about referring to Sherlock Holmes in descriptions of the play. It also means that there is a diminished imperative for referring to the investigators as only The Detective and The Doctor. Nonetheless we won’t be rewriting the play to give the characters their “true” names, as that would be, well, less funny. On March 25th Shakespeare in Busan performed a theatrical adaptation of Ryan North’s To Be Or Not to Be: That is the Adventure, a “chooseable-path” retelling of Hamlet. Like You’ve Ruined a Perfectly Good Mystery, the play featured a narrator soliciting choices from the audience. But in this case the audience was (potentially) global: the performance was livestreamed on YouTube, and viewers could vote by commenting on the YouTube video or by adding #tobeornottobe to a tweet. I enjoyed observing through @ruinednarrator the audience engagement on Twitter and the enthusiasm for this form of theater. Below is a recording of the performance, which features multiple passes through the book. In addition to choosing different directions for the plot, To Be Or Not To Be gives you the option at the beginning of following one of thee characters: Ophelia, King Hamlet (deceased), or Prince Hamlet. 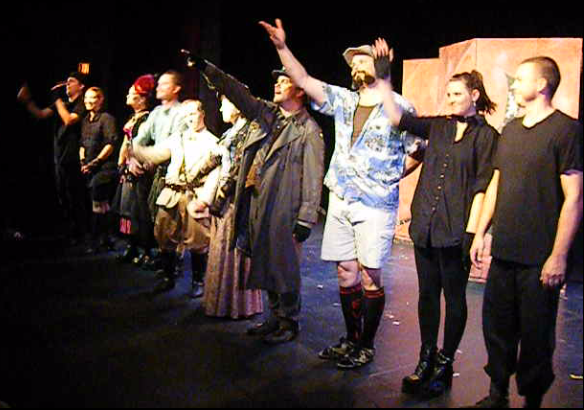 The top theater production of the past year was home-grown, a zany audience-participation Steampunk mystery that sprouted from the 24-hour Blitz playwriting challenge put on annually by the Mercury Players. The first day of FringeNYC and I am treated to this lively, funny and well turned out comedy…Every member of this ensemble is sparkling and on their toes. A show…that puts two of America’s favorite guilty pleasures together; a comedic murder mystery and a choose-your-own adventure book! The result is nothing short of a good time! This piece is interesting in part because of the comedy interwoven into the structure (a fun mix of parody and literary criticism), but more importantly the methodologies of how the story is told (using audience participation) are worth going to the play by themselves…You’ve Ruined A Perfectly Good Mystery! is truly a good example of the type of theatre that the New York International Fringe Festival exposes to a larger audience. This parody of the detective story, most specifically those about Sherlock Holmes, has a highly literate and often very funny script by Christian Neuhaus and Rick Stemm. But what really makes the play a success is Sam D. White’s superb direction and his talented cast.